Bridges may be the most invisible form of public architecture. Each day we cross bridges as we commute to work or school, visit family and friends, going about our daily lives. We take their presence for granted, never stopping to think how life would be different without them. Gallery 1855’s current exhibition No Bridge Too Far depicts the architectural and engineering aspects of South Australian bridges, with works by Adelaide artists James Parker and John Whitney. Using pen and ink, encaustic painting, digital imaging printmaking and installation, they explore the bridge as a landmark and anchor for identity of self and place. John Whitney is a well-known and highly regarded visual artist who has been working with South Australian schools and communities over many years. He started his working life as a secondary visual arts educator. After a number of years teaching he has dedicated his talent and skill to continuing his work with school students but as a professional visual artist. John won the Education and Arts Ministers’ Award for his work as an artist working in schools in 2003, and has also won a number of Art awards and prizes over the years. He has been a core artist working for Carclew’s Arts & Education Program in Artists in Schools, Arts Blast, Cargo and Creative Education Partnership Artist in Residence projects (AiR). John was one of two lead artists for Carclew’s AiR project in Murray Bridge in 2010, which went on to win an international award from The Campaign for Drawing (U.K.). John’s work is not limited to schools, as he is also in high demand for Adelaide’s annual WOMAdelaide, Adelaide Fringe and Festival. He also contributes his time and skills to working with communities and Councils both in metro Adelaide and regionally. Your joint exhibition at Gallery 1855, ‘No Bridge Too Far’ depicts the architectural and engineering aspects of South Australian bridges. How did this idea come about? Through Carclew I was teamed up with James and we have worked on several successful drawing projects, Come Out activities and other workshops in schools for the last nine years. Following my stroke in 2014, as part of rehab James suggested working towards an exhibition together on the topic “Bridges of South Australia”…… why bridges you can ask James more on that part! So for the past two years, armed with sketchbooks and cameras we’ve traveled the state in James’ van discovering and capturing bridges. For me I like the physical presence of a bridge; its structure, the material it’s made of, as well as the practical nature of safely crossing something. It is also a time capsule ……. often the remains of previous bridges stand beside the current ones, and locals have tales to tell of their bridge. I lived in Murray Bridge for four years and those bridges were certainly the main landmark. You have worked in several South Australian schools, as a teacher and as an artist-in-residence. How did you come to find your preferred visual arts medium? Drawing has always been my main area of interest in the Visual Arts as it’s important not only in the arts but right across our lives. It designs, explains and records much of our activities. It’s transportable and can have so many presentations from a scribble to photo realism.…… I’ve always drawn. I trained as an Art Teacher and taught in country and city schools for eleven years. I then resigned but got invited back into schools as an artist. That was thirty years ago. Since then I have worked constantly in schools doing murals, hebel carving, drawing workshops, painted poles – all over the state. I get inspiration from the world around me ……. physical objects, landscapes, buildings and structures more than the human figure. I enjoy recording the detail of the world around us; I always have a sketchbook or journal handy as well as a camera. Themes and topics develop over time which often evolve to be an exhibition or a series of drawings. No Bridge Too Far is on display from 10 May – 10 June 2017 at Gallery 1855. The Story Stones explored the human desire for meaning and story by Adelaide artists Belinda Broughton and Ervin Janek. Through her career, Belinda Broughton has used materials that range from dirt to the finest art materials, producing work in a diversity of art forms: paintings, sculptures, drawings, prints, collage, gallery installations, and installations in nature. Thematically she has been engaged with the cycles of life/death/life and order/chaos/order, with a focus on natural and purposeful mark moving towards script and symbol, and, recently, moving towards image and story. She has also spent the last decade focusing on poetry (with a decent publication record) and is interested in the interface between poetry and visual art. We asked for more details about ‘The Story Stones’ and her work. In the past you and Ervin ran a toy manufacturing company. Can you tell us more about this time in your life? Were you both practicing artists back then? It was a good little business. It paid the mortgage; brought up the kids. We made educational jigsaw puzzles and games and, with valued employees, did everything in-house – from the ideas and artwork, through to screen printing the images and woodworking, to packaging and promotion. We were also bringing up three kids, so it was exceptionally busy. Even so, we managed a shared exhibition, and we were in a number of group shows. Ervin also held a number of solos during that time. It was great to have an income to support our art. We downsized the business in 2001 and concentrated on art from then on. But we kept making a few of the more lucrative toy products until Ervin had a heart operation in 2006. Your exhibition at Gallery 1855, ‘The Story Stones’ features a range of work and mediums, including artist books, drawings, prints, photography, installation and sculpture. What draws you to so many art processes? Easily Bored? I love learning new processes and playing with materials, but I was having a hate affair with painting for a few years prior to this show, and had been concentrating on illustration, partly looking for a new business opportunity to replace the toys. I discovered I am eminently unsuitable for doing illustrations to briefs because I found it stressful and some little saboteur in my brain kept wanting to add inappropriate things, like gumboots to wedding attire, for example. So I allowed myself to go off on tangents and a lot of this work arises from that. It is completely different to the paintings I had been doing (non-representational, formalist field paintings), but I’m loving the figurative playfulness of them. And even feel that I’d like to move into painting again. As for the books, I am a poet, and words play a huge part in my art and life. So between words and illustration, it is natural that I would get into books. I will explore books more, both published and artist books. Ervin has always worked in photography, block printing, and sculpture. He is very inventive and playful, especially (in my opinion) in photography. ‘The Story Stones’ is about the exploration of the human desire for story and meaning. Can you expand on this? Well, stories are just so important to human beings aren’t they? Historically they have been used in many ways, for example, the passing down of critical survivalist information, the delivery of news, as a type of subversion against political powers, as an aid to rites of passage, and they have been used, simply, to entertain. It has been posited that there are a very few types of stories, and yet these stories have been told in infinite ways across the world throughout human history. Ervin tells a great story, a facility I plundered to write my book Sparrow, Poems of a Refugee, (his life stories in poems). As a writer I am fascinated by story, the concept, and by individual stories. Meet me and it won’t be long before I prise your life story from you. Ervin’s work is very often about actual stories, but also can be a suggestion or a trace of story. My newer work is often allegorical also. A few years ago Ervin produced an exhibition called Unfinished Allegories, photographs that suggest stories, but which he invited the viewer to ‘finish’. This began a dialogue between us about the nature of story and whether stories are ever really finished. I have a rock sculpture on which I had inscribed the word ‘story’ over and over again. As I worked, the grease from my hand smudged some of the words, and I had to work over them again. It became a sort of palimpsest of itself. Called The Story Stone, it seemed a great metaphor for stories, how they fade and keep renewing themselves. Once Ervin and I appreciated the concept of story as a connection between our practices, we went with Story Stones as an exhibition title. Compost is quite fertile, isn’t it. Actually the cycle of life, death and renewal (or chaos-order-chaos) is one of my big themes, so compost is, in fact, quite inspirational. I love mark, accidental, natural and human. I love processes and seeing what a different process can offer. I am interested in myth and science, fibre and other crafts. I am appalled by politics. I am renewed and inspired by nature in general, and am appalled and frightened on it’s behalf too. I have very broad interests and do not separate my writing from my visual arts, so there are a lot of things at play that find themselves being expressed. Ervin is interested in expressing his feelings, and is always exploring new ways of doing that. Also he keeps himself alert to what is happening around him, so he might, for instance, see a shape in a tree that he will photograph and team with other images in his composite photographs. Or, if he is working in wood or stone, he works with the materials to enhance what they have to offer. on occasion, from my position, Ervin’s connections seem arbitrary or unconsidered, and next thing he has expressed something so precisely with these very connections, that my jaw drops. Oh, I don’t know. I think I need to have a post-exhibition crisis first! But seriously, it is too early to put rigorous demands on myself. One needs to find time to play. It invigorates whatever is coming next. I don’t usually find out what I’m really doing until I am part way through. I have the desire to take some of my playful figurative images and see what gestural acrylic does to them. I have a collection of poetry coming out from Ginninderra Press towards the end of the year. I want to produce some artist books and I have a new blog to set up. Lots of plans, but I find that, since the exhibition, I have been drawn to writing poems, and have even written a couple that I like. Ervin is working away on small stones. He calls them pain-killers, as the process keeps his immediate concerns at bay. We lost a son to brain cancer last year, so there is a fair amount of avoidance behaviour going on in our life. Craft helps. He will continue to put two and two together in his photographs. at least that is how I know him; photography is a constant in his life. But his aim in the near future is to throw himself into woodblock printing again. The Fringe Festival is around the corner and we are about to launch our bi-annual ceramics exhibition Hills Edge Clay. We’re presenting the work of 20 Adelaide based artists, including Lauren Abineri, Alison Arnold, Amelia Castellucci, Anna Couper, Jo Crawford, Nikki Dowdell, James Edwards, John Feguson, Helen Fuller, Philip Hart, Marie Littlewood, Sunshine March, Sophia Phillips, Sami Porter, Alison Smiles, Merrilyn Stock, Silvia Stansfield, Samone Turnbull, Mark Valenzuela and Angela Walford. Tea Tree Gully has a certain affinity with clay – historically (in terms of porcelain clay mining) and creatively (in terms of the local community’s interest and engagement in ceramic art). Since Gallery 1855 opened, we have worked towards deepening this affinity by connecting South Australian ceramic artists with the community through Hills Edge Clay and other creative development activities. Exhibition launch: Sunday 5 February 2017 | Opening speaker: Klaus Gutowski, ceramic artist | Exhibition continues until Saturday 18 March | Images: Alison Smiles, Koala Jars, 2016, South Ice porcelain, glaze, gas reduction fired; Sophia Philips, Seed and Wreath, 2016, porcelain, wire; Merrilyn Stock, Diving on coral, 2017, Celadon glazed, southern ice porcelain; Helen Fuller, Vide poche, 2016, Terracotta, slip, oxide; Marie Littlewood, Tri pods, 2016, raku clay, glaze. I heart paper by Ellen Schlobohm, is a ‘love letter’ from the artist to her chosen medium, reflecting on the true beauty of paper & Ink works by Cathy Gray, a collection of intricate pen and ink patterns on paper. Both exhibitions demonstrate an intuitive approach to design and to the materiality of paper, but in very different ways. Cathy has focused on abstract black and white pattern designs, while Ellen’s approach to her intricate paper cuts is more relaxed and conceptual. Image: Cathy Gray, Balance (detail), 2013, pen & ink on paper, 75 x 75cm. Image: Ellen Schlobohm, Woven, 2016, hand-cut fabriano academia 200gsm, thread, approx. 23cm x 23cm. My pen is my constant companion. It has enabled me to express myself freely over the various periods of my life. So, with only pen and paper I begin with a dot. My work is rarely planned. I prefer to let each piece evolve and guide me. This approach gives me freedom from expectations. The majority of my work takes the form of a circle. For me the circle transcends time, cultural boundaries and evokes harmony and peace. It reflects wholeness and our interconnection to the world around us. In the beginning is the end and in the end is the beginning. I draw exclusively in black and white. In all of the complexity of my art, restricting the colour palate to black and white brings with it certain stillness and simplicity. While a coloured palate enables you to glance at a picture and see the colours, black and white forces you to stop and look deeper into the piece; allowing you to see the story behind the art. Image: Cathy Gray, Unspoken Word, 2015, ink on paper, limited edition print, 700 x 700mm. ‘I heart paper’ is a love letter from a paper artist to the medium in which I work. My skills have been tested as I’ve pushed the boundaries of practice to reveal the true beauty of paper. Several of my pieces include thread or other intricate 3D elements. Other works acted as skill testers, challenging me to see just how small I can cut. My work is created by meticulously cutting away paper by hand to leave behind delicate tableaus. I’m drawn to paper as a medium for its simplicity and strength. I also delight in watching this humble material come to life as I make each cut and the image is revealed. I have expanded my arts practice to include other artistic avenues such as screen-printing, installation and mixed media works. This year I’ve taken part in several exhibitions and was a finalist in the Emma Hack Art Prize with my work The Eyes – a papercut photograph featuring my sister. Ellen Schlobohm, Flourish (detail), 2016, hand cut Fabiano academia 200gsm, screen-printed Fabiano academia 200 gsm, 50 x 50cm. Cathy and Ellen’s work is on display at Gallery 1855 from now until Friday 24 December. Adelaide designer Margie Kenny’s illustrations at Gallery 1855 are vibrant, charming and yet thought provoking. Her latest exhibition Connected explores the idea that all creatures and nature are connected and that life is an incredible force. A childhood spent in the Adelaide Hills impressed on Margie a love for nature and a passion for conserving native habitats and species. Her illustrations aim to capture nature in a way that brings joy to viewers and an awareness of the role we all play in preserving the environment. Tell us about your artistic background. I always loved art and design in school, and went on to university to study a Bachelor of Education specialising in Design. I then worked as a graphic designer and illustrator in the areas of health and education, and began teaching design at UniSA. I have exhibited in several group exhibitions, and this is my first solo exhibition. What is your current exhibition at Gallery 1855, Connected about? Connected is about how nothing happens in isolation on our planet – all creatures and habitat have an effect on one another. Creatures are so closely connected to their habitat. It’s a celebration of the beauty of nature – from wildlife across the world to a ladybird in the backyard garden. The exhibition also highlights a connection we may not be so proud of – the rapid loss of habitat and wildlife through deforestation to feed our consumption of palm oil in processed food and household products. Image: Margie Kenny, In the organic garden (ladybird), 2016, hand drawn mixed media digital composite print on cotton rag paper, 52 x 52cm. Why is the natural world so important to you? My love of nature goes back to my early childhood growing up surrounded by scrub and native wildlife in the Adelaide Hills. The natural world supports the life of all creatures including humans, and without it we could not survive. What concerns you about the world we live in? There is an alarming rate of change in the natural world primarily at the hands of the human race, and I believe as individuals we can have a more positive influence on change. For example, there are critically endangered species losing their habitat and lives through rapid deforestation to make way for palm oil plantations – while we continue to consume palm oil which is hidden in a high percentage of supermarket products and processed food. It can go completely unnoticed to many of us, even to those who are nature lovers. Image: Margie Kenny, Gardener’s companion, 2016, hand drawn, digital composite print on cotton rag paper, 52 x 52cm. Where and how do you make your works? Several of my pieces are detailed and realistic in tone and form and are produced in my studio by hand, using graphite pencil or biro with my own photographs as reference when drawing (e.g. Turning tide, Nature’s fine line and Microclimate). Some of my most recent pieces (e.g. Habitat and Uncertain future) begin with an idea that is drawn roughly on layout paper then progressed to a final accurate line drawing. These drawings are then scanned onto the computer, and hand drawn/painted colour textures are also scanned and cut to shape and combined with the line work in Photoshop software. The final illustrations are then printed at a high resolution onto cotton rag paper for a high quality finish. Image: Margie Kenny, Rhythm of life, 2014, hand drawn, digital composite print on cotton rag paper, 51 x 51cm. What you hope people take away from seeing these works? I hope the work brings joy and inspiration to the audience, and perhaps a renewed awareness of the role we all play as consumers. Informative bookmarks are available to take home to enjoy and to help identify palm oil in products we buy. Image: Margie Kenny, Microclimate, 2009, ball point pen on paper, 53 x 53cm. I’d like to further explore the idea of habitat and endangered species, focusing on the concerns but also on the positive work being done in Australia and overseas on rescuing and reintroducing wildlife into habitats. In the process I will also be exploring illustrative styles for my own development as an illustrator. Connected is a Gallery 1855 exhibition at 2 Haines Road in Tea Tree Gully, from 12 October until 12 November 2016. Paper and multimedia artist Catherine Hewitt recently exhibited her work in Remnant Formations at Gallery 1855 during SALA Festival 2016. Hewitt’s interest in geology and love of nature walks prompted her latest work, part of her ongoing investigation into how landscape formations are interpreted by tourists, collectors or purveyors. Both natural and manmade materials are used for clash and harmony in her works, to depict ancient landscape formations. Soft and yielding materials like seagrass and cotton rag are used as a foil against grittier elements like copper, steel and rust. What or who has made a great impression on you? I have always had a keen interest in art since I was a child – my father in particular encouraged me to paint- he bought me some paints and took me with him when he was out painting (painting for him was a hobby). Whilst studying graphic design in Tasmania I also took courses in photography and printmaking and enjoyed being able to combine these related mediums. I’ve worked in freelance design and for a number of years had a stall at various markets in Tasmania. I moved to South Australia at the end of 2004 with my two children. The following year I started working at the Hahndorf Academy where I met Regine Schwarzer with whom I am currently exhibiting. We both did the Masters by Coursework at UniSA at the same time and have exhibited together over the last few years. Your current exhibition at Gallery 1855, Remnant Formations references mineral and rock formations. Is geology a personal area of interest of yours? Yes! Actually, I would say that science in general is of interest to me – it often provides the grist for my mill! I like to walk and when I do, sometimes I find things of interest and I like to find out what these things are – where they fit in the ecosystem, what role do they play. For example the group of handmade paper lanterns in the exhibition titled of a gorgeous nothing are a result of finding a seagrass ball (then hundreds more!) on Goolwa beach. 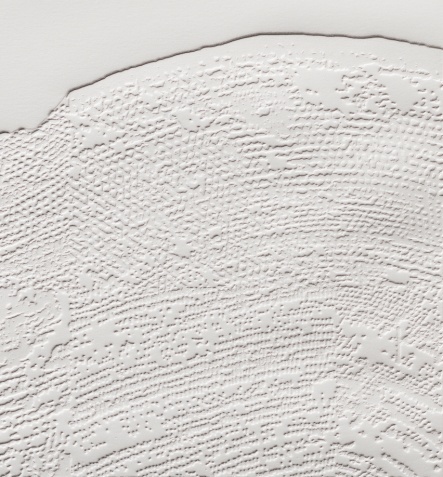 Likewise the embossing titled Lithos is my interpretation of limestone rock formed from marine particles. Once while walking on North Keppel Island, I found a small disc with a hole in the centre – then I found many more and many years later I found out what they were – Foraminifera. I do like rocks and the whole geological interconnected process – how mountains are formed, the different types of rocks, the layering, the colours, the erosion that results in beaches. A few months ago Regine and I both went on a hiking trip to the Flinders Ranges. I had never been there. Walking through the various gorges and seeing all the striping in the rocks was wonderful. In fact, the oxides that I have used in some of the work come from there. How did you begin this collection? Was there something in particular that triggered its development? This collection of work is a continuation of previous work. I am really interested in how our landscape is formed and how we define and delineate that landscape. I find maps and mapping very interesting. Previously I had used digital photography to represent this and for this exhibition I wanted to leave the computer and return to something more hands-on. You say the production processes mimics the natural, in terms of how you have interpreted minerals, rocks and sand in your work. Is this easier to do than it sounds? It was not something that we set out to do, rather that it was something already happening within our processes. In nature nothing is wasted, everything is used, transformed, merged; there is erosion, heat, and reforming of materials. As artists we do the same, working with the materials of our choice. Metals are shaped by applied pressure, cutting and heat; stones are cut and shaped and placed with the metal; paper from plant matter is broken down and reformed. What would you love to work on in the future, or who would you like to collaborate with? I will continue with what I am doing at the moment knowing that one thing always leads to another, even if there is a break sometimes. I always enjoy working with Regine and love the way our work sits together. Another artist I would like to collaborate is metal sculptor, Astra Parker.